As for 2012, the area’s red wines, especially the pinots, which generally looked to be fruit-forward for early drinking at the outset, have surprised most people, including this writer, by taking on a more serious, structured mien than seemed possible during their infancy. The extroverted fruit that was apparent early on is still in plain view, no question, but the wines typically display more grip than they showed last year, as well as more tannin presence. They haven't hardened up so much as straightened up, which bodes well for cellaring. I talked with a number of winemakers about the fact that many vineyards in the area, especially the most highly regarded ones, are moving into maturity, and are thus now yielding grapes that can produce wines with more structure, depth and power. Quite a few winemakers, like Brian Loring and Brandon Sparks-Gillis (of Dragonette), noted that this kind of fruit means that less new oak is needed now: "The wines have their own native tannins and structure so new oak becomes more a distraction than a benefit." I think they're onto something here: I tasted more young wines this year that exhibited greater varietal expression and Old World-style complexity than ever before. That was especially the case with many of the syrahs, which often showed less of the primary, jammy, even decadent fruit character that marks so many New World takes on the variety. I was thrilled to find more northern Rhone-ish olive, smoked meat and floral qualities than I've come to expect from the New World, and we're talking about two vintages, 2013 and 2012, that definitely lead with fruit. Speaking of lumber, the move away from new oak is obvious throughout the region. This trend is being driven both by the palate shifts of consumers and sommeliers and by the desire of winemakers to make wines more in line with what they like to drink, as a number of them put it. 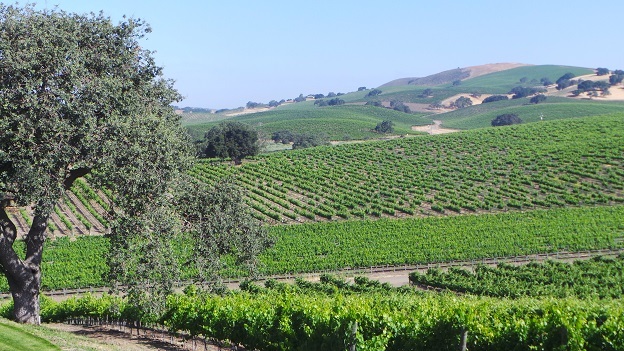 With a few exceptions this is a cool climate, by California standards, so the region has always been in a position to make low-octane wines, even without harvesting in, say, August. Growing seasons here tend to be long, and the arcs of building fruit maturity and descending acidity are slow and steady, without the crazy heat spike dangers of, for example, Paso Robles. “Hot” is a relative term and it’s good to remember that compared to many New World regions, greater Santa Barbara can be downright cold. Plus, it enjoys beneficial, often wide diurnal temperature shifts, even in the middle of the summer, as anyone who’s been there at that time can attest. There has been plenty of buzz over the subject of winemakers asking for fruit that's harvested earlier than has been the tradition here—for higher acidity and lower sugar and thus lower alcohol and pH levels. Those earlier picking times can be too early, even way too early, in the opinion of detractors, who question whether the resulting wines will have the stuffing and structure to age well. That debate isn't just heating up in Santa Barbara County, but up and down California, as has been discussed in our coverage of North Coast wines in the past. We're still waiting to see how the wines made under such strictures turn out in the long run; but based on examples I’m tasting from across the State that are hitting their fourth, fifth and sixth birthdays, I'm a lot more confident in their promise than the naysayers are.